Property Highlights: Remodeled. Walk to town & Ruth Hardy Park. Heated in-ground pool. Covered dining pavillion. 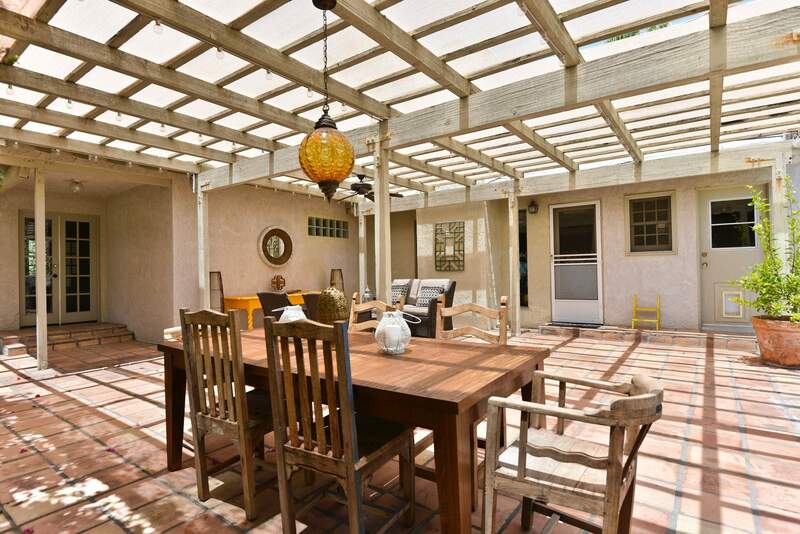 1,836 square feet, central location, mountain views, open floor plan, updated and remodeled, over-sized walled property, fruit-bearing citrus trees, 25 foot heated in-ground pool, off-street covered parking, king master bedroom sleeps 2, plus additional two-room guest suite that sleeps up to 4. This is an ideal vacation home for romantic getaways, small groups, families, extended weekends with old friends, month-long holidays for out-of-towners and artists/writers looking to get away from it all in a quiet and serene setting. 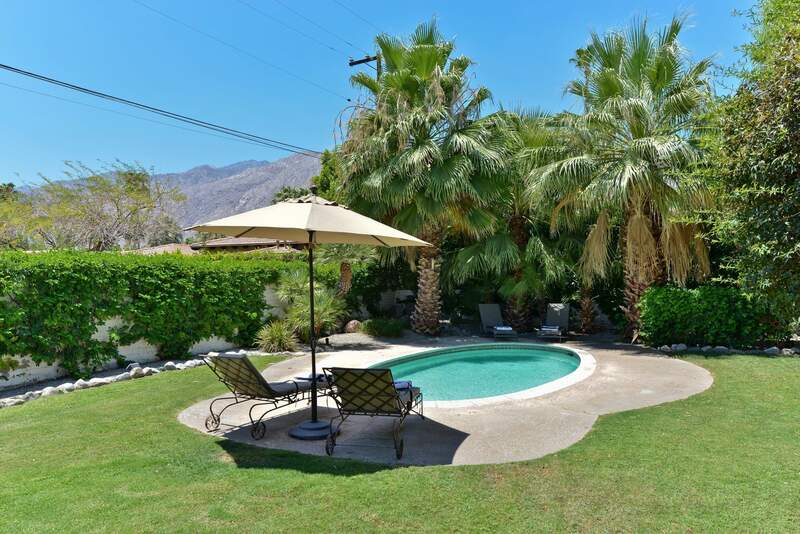 The central location makes this property a good choice for biking and hiking enthusiasts, golf outings, convention goers, special event attendees, those participating in local art and music festivals, and anyone who wants to immerse themselves in all that Palm Springs has to offer while taking advantage of the walk-to-town location. Past guests have raved about how well-maintained, clean and comfortable this home is. Others have commented on the central location, the great layout, and the beautifully landscaped patios and pool area. "The owners have thought of everything," posted one recent guest. "The home exceeded our expectations. We will be back again next year!" Unverified local folklore claims the home was originally designed by Edwin B. Willis, who created the set for the 1939 film, The Wizard of Oz. 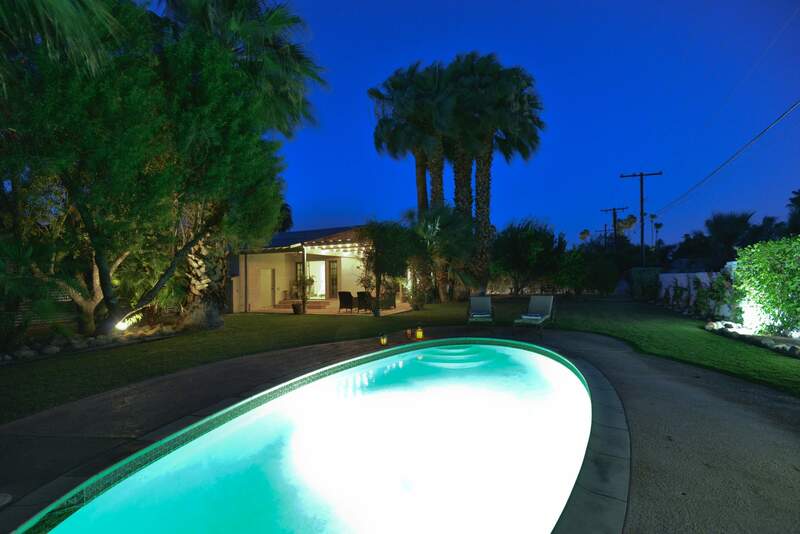 Walk to the Uptown Design District from this classic Palm Springs vacation retreat, located in the famed Movie Colony East. The current owners have preserved the original architectural style and chic ambiance of this story-book property, while updating it to appeal to modern-day vacationers. 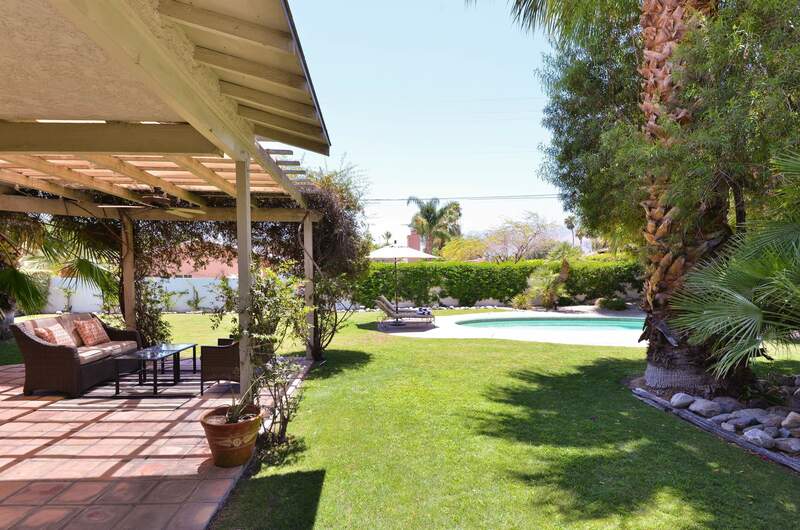 This home was built in the 1930s, the decade when silver screen legends like Lucille Ball, Bob Hope and Greta Garbo flocked to this neighborhood to relax and play beneath the radar of studio heads and Hollywood gossip columnists. A throwback to the laid-back yet glamorous California-style of yesteryear, this lovingly restored home is nestled on an over-sized lot (nearly a half acre) just steps from Ruth Hardy Park. The property looks as though it was lifted from the pages of House Beautiful or Better Homes & Gardens. It is easy to imagine the likes of Spencer Tracey and Katherine Hepburn having a romantic rendezvous - dining alfresco on the rambling, spacious, saltillo tiled veranda. From the walled and gated entry courtyard and the arbor over the font to the lush lawns, stone paths and bougainvillea-covered trellises - every inch of this home tells a wonderful story. 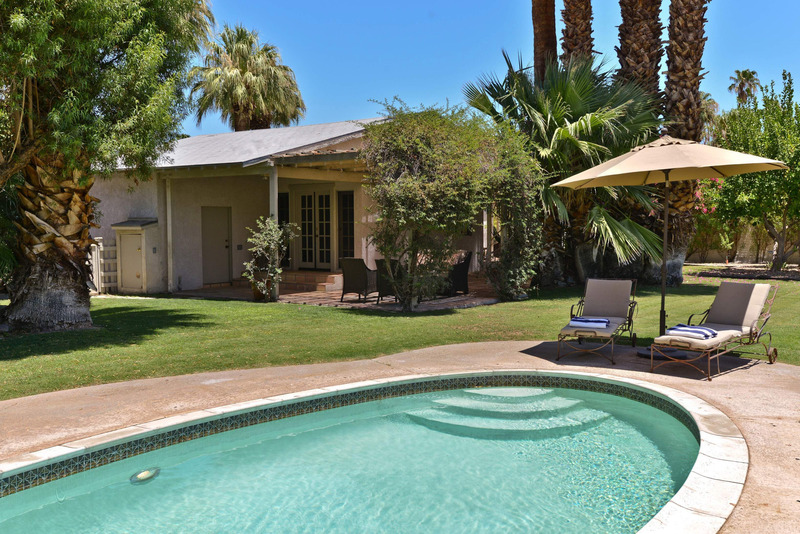 There are towering Palms, gorgeous citrus trees, and a fabulous in-ground oval for spending leisurely afternoons in the warm desert sun and long evenings under the stars. The simple sophistication and understated elegance carries over to the interiors where you'll find an open concept living room, and a well-stocked cook's kitchen with high-end, stainless steel appliances. There is also a farm house dining room that seats six to eight. The separate den features a bar, a gas fireplace and a comfortable daybed -- ideal for curling up with a good book or settling down for that late-morning nap. 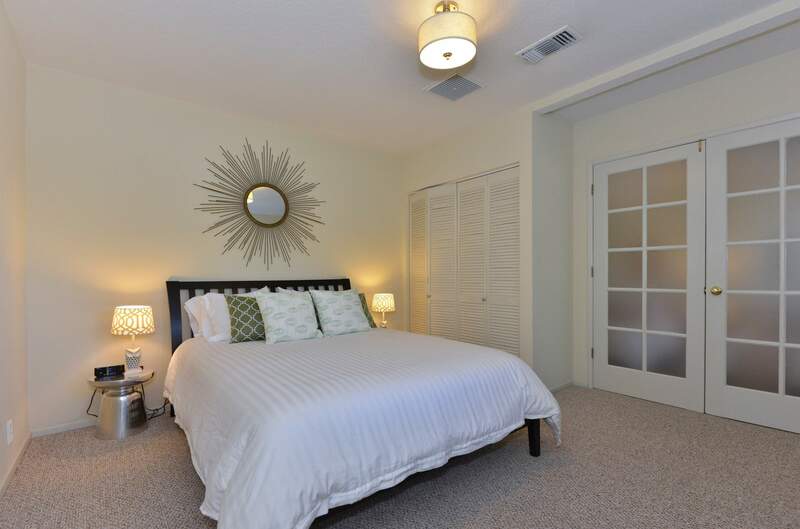 Your large master quarters has a walk in closet, en suite bathroom, a California King Bed, a seating area with comfortable loungers, and direct access to the patio and pool area. 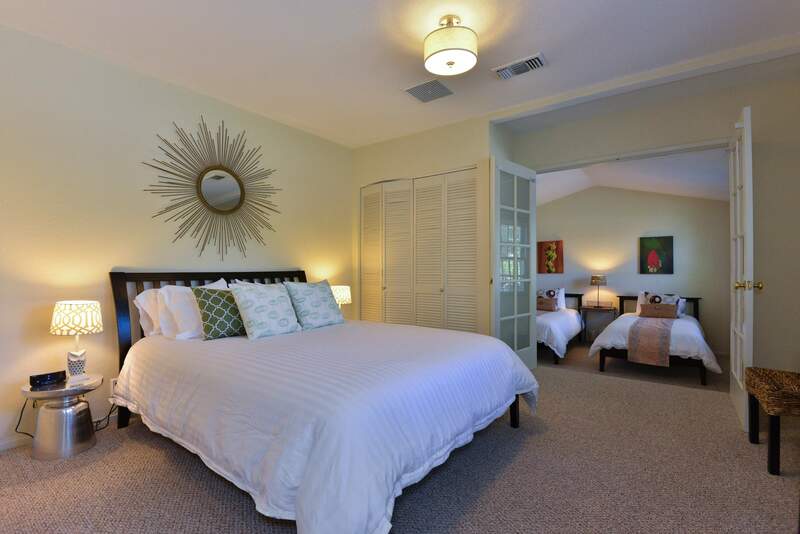 The additional two-room guest suite has been handsomely appointed with a Queen size bed and an additional sleeping alcove where you will find two comfortable twin beds behind a set of beautiful French doors. This extra space is the perfect solution for teens, tweens and overflow guests. "Plenty of room for the family inside and out. We had a blast swimming in the pool and relaxing under umbrellas and palm trees. 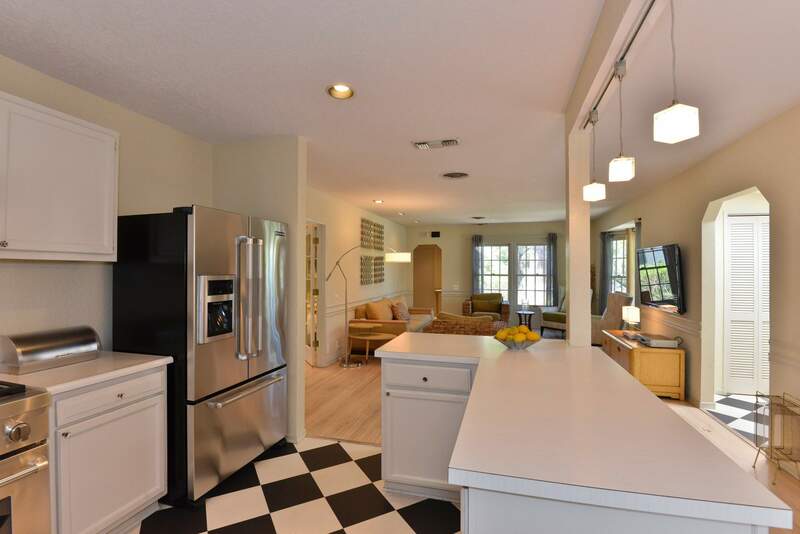 Walking distance to the park and downtown. Will be back soon for sure. " "ACME House Company vacation rentals in Palm Springs has managed my home Ruth Hardy Park Oasis in The Movie Colony for the past year. My experience with them has been excellent. Housekeeping is amazing. Their standards for cleanliness are impeccable. Maintenance is extremely efficient and address any of my needs immediately. I highly recommend ACME house company if you are seeking a professional and efficient property management company." "We made our vacation plans late, and had a limited selection of houses available for the holiday weekend. That being said, the photos on your VRBO rental site looked cozy and spacious, the accommodations met all of our needs, and overall it looked like a wonderful, relaxing place. The temperature of the pool was outstanding, as was the overall privacy of the property. The biggest surprise was how nicely the kitchen was stocked with utensils and appliances. We truly had a wonderful weekend, and thank you for allowing us a later check-out!" A cool stay in hot Palm Springs! "The pool, size and privacy really attracted us to this property. The communication with ACME House Co. was fantastic during the leadup to the stay, and during. We rented some baby equipment through a referral from Acme, and the company came and set it up prior to arrival, which made things super easy for us. The temperature ended up being 115 for part of the weekend so that was a suprise but the house's AC was fantastic and the pool was as cold as we needed it. We found the heat was easy to beat with those two amenities. The house was incredible and we loved our experience throughout. " "Liked the location, the layout, and the backyard of this property. We enjoyed our stay, the home was nice, and we'd stay at the home in the future when we return to Palm Springs again. " "The Ruth Hardy Park Oasis exceeded all of our expectations! The pictures and reviews online looked great but what we experienced on our arrival was a literal charming paradise!! The grounds are absolutely beautiful! 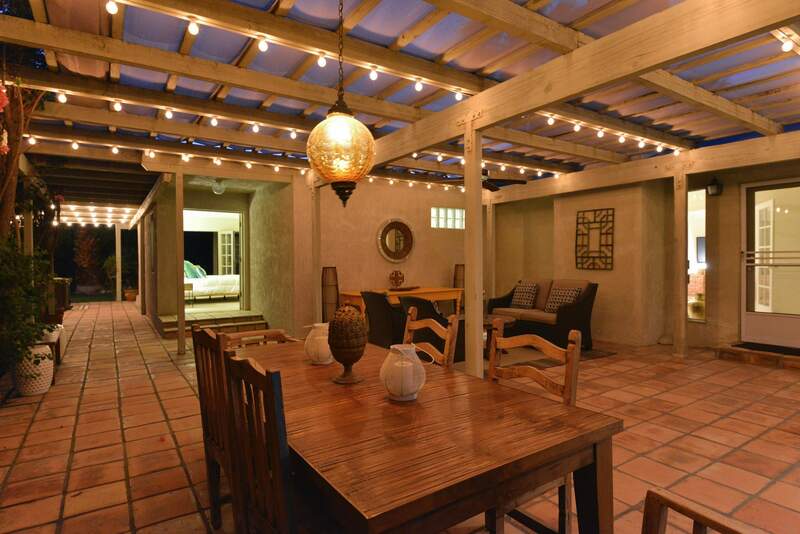 The added touches of patio lighting and furniture were wonderful and relaxing. The house itself was decorated beautifully and had all you could need for vacation. My husband and I took our four grandchildren and there was plenty of room and always plenty of supplies. We cannot wait to return!" Relaxing and Close to Everything! "We had such wonderful and relaxing time while staying at this house. The yard is huge and quite and the pool is very nice and relaxing. It is with in walking distance to Ruth Hardy park where we spent an a nice afternoon. We also walked down town and went shopping and dining out nearly every night. I will definitely be staying here again!" Would rent again in an heartbeat! "We have a young boy and being close to the park was a plus, we went every morning and evening. It was so great to be close to the playground so he could run around. We also wanted a pool and some yard for playing. The pool, the fireplace, the whole house, loved it all, it was so comfortable. I only wish the weather was a bit warmer, it was really cold getting out of the pool! Biggest surprise was how big the house and yard were! The pictures were nice, but it really did not show how big the yard was and the rooms were. I would rent this house again in a heartbeat! In fact I think I will only use and (highly recommend using) Acme when we stay in Palm Springs again! " "The whole experience with the rental formalities are easy and efficient and were done all via email. We have previously rented with ACME and it was another good experience. The house and gardens are gorgeous! The house really felt like our home during our stay, and was as great as we remember from last year! We will certainly rent with ACME again. " "Enjoyed the yard with the pool. It was so peaceful. Our experience with Acme was a true pleasure. So very accommodating and professional. " "I found the house comfortable! Very good in cleanliness, comfort and style. Will recommend to friends and family!" Manager Response: Thank you for letting us know about a couple of maintenance issues at the property. We will have our team look at the couch cushion out by the pool and also have them check on the sink garbage disposal. Thank you for bringing these to our attention. "ACME House Co. was excellent in meeting our overall expectations. They answered questions promptly, handled change of venue seamlessly, and communicated well. We really liked the location and amenities this home provided, and the house and grounds were spacious. We enjoyed the heated pool,too!" 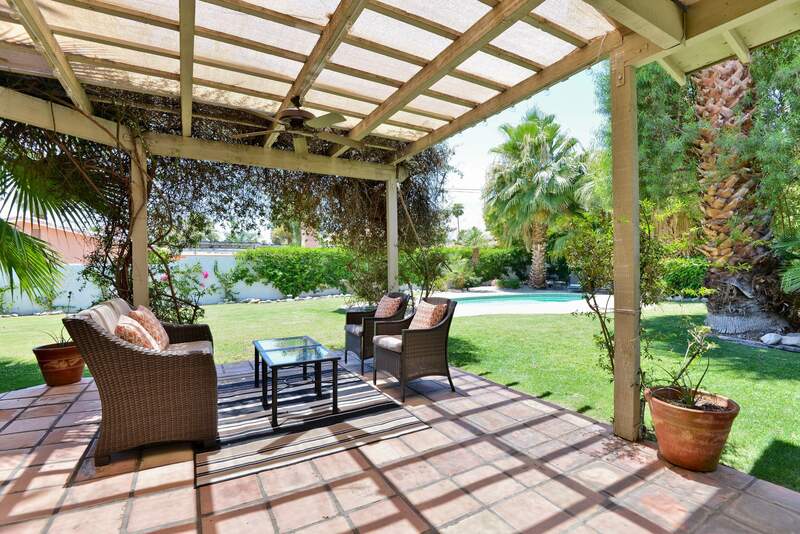 "Great house, very comfortable, relaxing few days in PS, wonderful service from ACME. Happy New Year!" Very quiet, comfortable and gorgeous! "The reservations staff is very nice, easy to work with and very organized. Loved the electronic process. The house is very quiet, comfortable and the outdoor space is gorgeous. Loved the fresh lemons in the back yard! We would definitely rent this house again, in the warmer months. We really wished it had a spa or hot tub. We weren't aware that there was a code to the driveway gate so we were trying to use the code for the lockbox on the walkway gate. We arrived after dark. It's possible that I missed the driveway code info in one of the emails with the arrival instructions though. " "Chose this house because it was managed by Acme House Co. Great selection of properties! Courteous, responsive service. Best part was the location and heated pool! 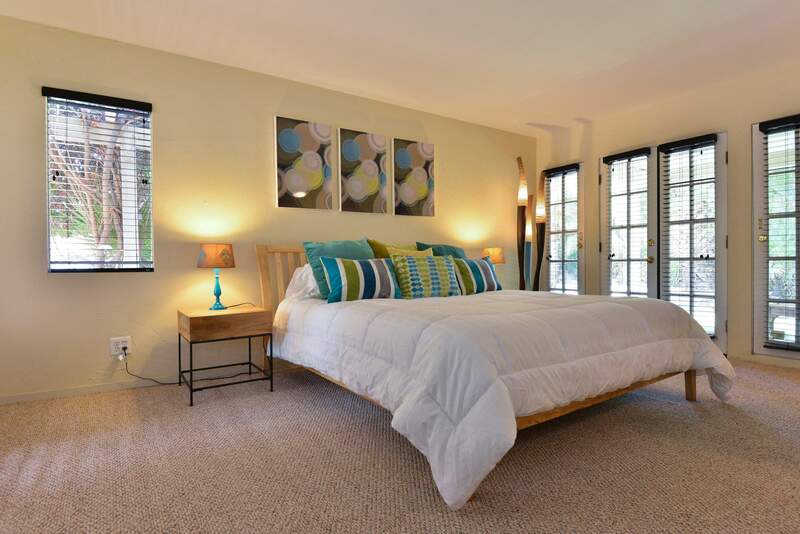 Master bed was a bit soft for me - but other than that this home was excellent in meeting my overall expectations." We chose this property for the location and amenities. 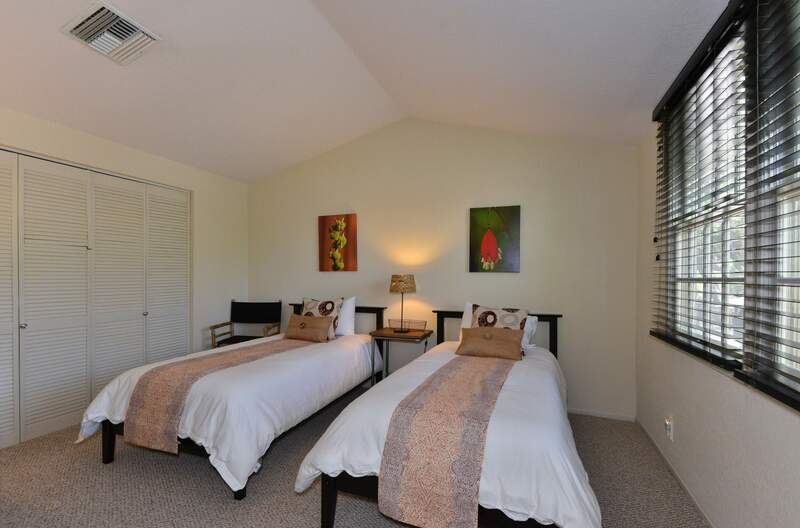 "We chose this property for the location and amenities. The best part of our experience was spending the holiday with family. Everyone had their own space. Kitchen and dining provided everything for our Thanksgiving feast. We recommend this vacation home for its large property, several outdoor sitting areas, pool, nicely furnished, park access for kids, relatively easy walk to town. " We didn't want to leave the house! "Would love to stay longer next time! Such a lovely house to stay in! The trees, garden and outside spaces were absolutely lovely. It was in the area we wanted to stay and the price was competitive. Excellent rating for cleanliness, style and comfort. We recommend Acme House Co. to our frineds. Booking process was easy and efficient. Good communication. " "We have stayed at this property before. We enjoyed the property and dealing with your company last year. Our arrival experience has always been excellent and inviting. It was a lovely suprise to find a welcoming bottle of wine. 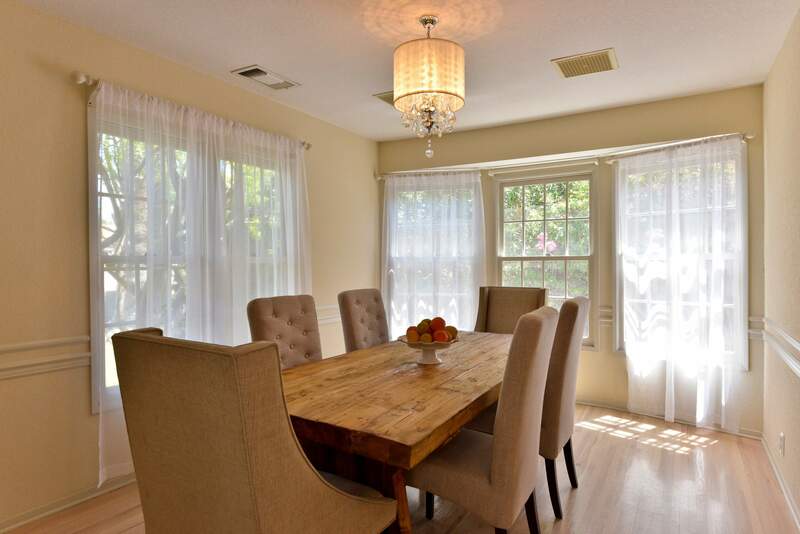 The best part of this rental was the outdoor experience and it was made more enjoyable by the changes made since our last stay including the improvements to the patio area."